With pride we followed the invitation of the maverick Club to the Awards Gala at the chic BWM-arena in Munich, because we were nominated with the welcome app as finalists in the category of green. Chosen among hundreds of submissions, was best presented our project as one of the five. We have not gotten then unfortunately but the award itself – more than understandable, because our project is still in its infancy and the other highly professional finished products were top presentation videos. 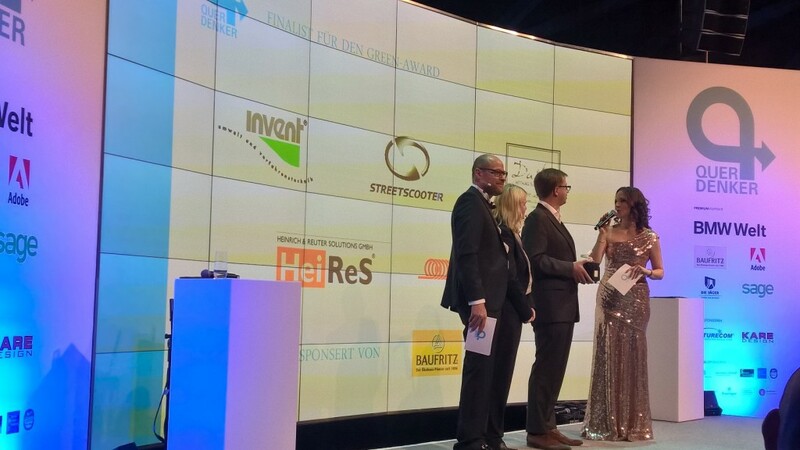 In our category, the company Hemstedt took deserves the prize for its sustainable product. The event on the Friday Viola, Peggy and Lars have themselves visited. Chic dressed up we were able to experience in illustrious company of media and economic prominence as we found positive mention "on stage". On the guest list of the evening that was interested in innovation who-is-who of the German economy. Through the awarding of honors, illustrious representatives of media celebrities were suburb – onstage and in the audience. The recipients of the honors were Thomas Gottschalk, Hans-Dietrich Genscher, Sonja Church farm, Dr. Michael Otto, Helmut Markwort, Thomas Müller and posthumously Steve Jobs… The presenters were not less prominent as z. B. Hannes Jaenicke, the Peggy personally very impressed. For us is already that the maverick award also 2016 is an event, which we will have on the piece of paper.